My father was the eldest among my grandfather’s four sons and I am his first grandchild. My grandfather was retired when I was small and taught me many valuable things orally before I learned to read and write. Generally, the first child of a family learns literacy a bit late and the subsequent children learn to read and write relatively faster by following their elder siblings. This happened in our house too as my younger brother Ghulam Muazzam was just one class below me though he was two years younger. He would approach me whenever he would see me studying and therefore learned to read and write before he started school. I started learning to read Qur’an in the mosque after morning prayers at the age of six. All the children in the village used to go to the mosque to learn how to read the Qur’an with the local Qari1who made everyone memorise the Qur’an until Surah al-Duha2. There was a tradition that when someone would complete memorising until Surah al-Duhaa, their family would send pitha (Bangladeshi pastries)3 for everyone in the mosque so that the whole village would know which boy or girl has achieved this feat. This was such an inspiring event that everyone wanted to compete with each other to master the chapters. The Qari also taught us how to pray by making us stand together and recite aloud every stage of a prayer and correcting us if we made a mistake. He would also ensure that we performed all the different rituals of the prayer correctly. I would have my grandfather’s company for much of my time at home. He helped my brother and I memorise Surah Yasin4 and would often ask us to recite the chapter to him to ensure that we had learned it properly. When he was satisfied that we had successfully memorised the chapter, he said to us, “The Prophet (PBUH) has asked us to recite this chapter when a person dies. You should recite Surah Yasin in front of me when I die.” We recited the chapter when he passed away many times before he was buried. I was not sent to school for a year to ensure that I first learned how to read the Qur’an independently without help; so I did not start my primary school when I was six as is usual. I would go to the Qari in the morning and would learn from my grandfather in the afternoon and evening. Thus, I learned how to read the Qur’an properly and independently within a year and then started primary school when I was seven. The headmaster of the school was from the Sarail sub-district of Brahmanbaria district. He lived as a tutored lodger at one of the houses in our area from where the school was a few minutes’ walk. In my exam results I came first in my class5 and was promoted to Class 2. Following this, the headmaster ordered me to see him every day in his office half an hour before school started and I would give him an update about my progress in my studies. He also encouraged me to take the Class 4 primary scholarship exams. He never demanded money for this extra tuition; headmasters at that time would take special care of those students who had potential so that they could be successful in the scholarship exam and bring honour to the school. I used to go to school with the headmaster and return with him. On the way, he would ask me about my studies. His love and care made me so attached to him that I would speak to him frankly even though I was very afraid of him. He used to do dictation tests when I was in Class 3 and one day while checking how we did, he discovered that I had made one mistake. He became angry and hit me with a cane, whereas he said nothing to those who had made many more mistakes. I felt very upset and asked him, “Others made so many mistakes, but you beat me up for only one error!” Seeing my reaction, he called me near him with affection and said, “I can’t tolerate even a single mistake by you.” I became overwhelmed by his love towards me and tears began to stream down my cheeks. Later, I once visited him in 1950 in his village when he was elderly. He became very emotional seeing me and cried whilst hugging me, which brought tears to my eyes as well. I can never forget that moment. It is difficult to imagine such relationship between a teacher and a student in modern times. The teaching method of our headmaster was also very unique. He used to make us memorise complex mathematical calculations, which made us so confident that we could even solve maths problems of higher classes. He also taught us another technique: to look through the topic of the following day in advance. When he went through the lesson the following day, the concepts became so clear that revising them at home was unnecessary. This technique helped me perform well during studies at college and university as well. As I would go through the topic in advance, everything became clear and I would only take down notes of some of the things that were difficult for me during my pre-reading. Those notes were to be very useful during exam preparation. Thus, my primary school headmaster was a guide for me even when I was at university. I was promoted to Class 4, coming first in my class, and the headmaster inspired me to take the scholarship exam at the end of the year. However, my father and grandfather sent me to Barail Junior Madrasah three and a half miles away where I had to repeat Class 3. I had already lost an academic year, and now in order to attend a madrasah I was made to lose another year. This made me very upset, which came to the notice of my grandfather. I don’t remember exactly what he said or whether I understood what he tried to say. The only thing I remember is as follows: “You are the eldest in your generation. Your father and grandfather have mastered Arabic and, as the eldest in the family, you need to learn Arabic as well. There was no opportunity to learn Arabic in school, so you had to be admitted to a class one class lower than your level in order to learn the language properly.” He continued to encourage me, “You need to learn Arabic, Bangla and English very well. Your new institution will teach you all three languages from Class 3. There is no Arabic tuition in our village school, and English tuition is also very limited.” I became satisfied with my grandfather’s consolatory words and later realised how useful it was for me. To understand the significance of my grandfather’s advice, it is important to discuss the four types of education systems at that time. In the general education system, Arabic and Persian languages were compulsory from Class 7 to the end of secondary school, known as ‘matriculation’ at that time. At higher secondary level, known as ‘intermediate’, Arabic was optional and at undergraduate level, neither Qur’an nor Arabic was compulsory, whereas a selected course on the Bible, was. Hence, Muslim students remained ignorant about Islam through this education system. Whatever Arabic one could learn until Matriculation would be obliterated from the mind as it was not compulsory beyond that level. There was a lot of debate and speech competitions when I was at university, but I never heard any topic relating to Islam in those competitions. I started university in 1944 and took part in debating competitions while living in student halls for four years. It used to amaze me how even science students were able to quote Wordsworth, Shelley, Keats, Shakespeare and so on in their speeches on topics like materialism, dialecticism, evolution, nazism, fascism, democracy, etc. in English, particularly in the context of the Second World War at that time. There was little opportunity to develop the knowledge of Islam as general students never considered Arabic and Islamic Studies to be of any importance other than to those studying in madrasahs. These students cannot be blamed for this as the British colonial rulers introduced this education system in order to create a generation that would follow their own values, culture and civilisation. Those who still practiced an Islamic way of life despite being educated in this system were able to do so due to family influence and perseverance of their own. Their education had nothing to do with their religiosity. During the Muslim rule before British colonisation, graduates from the madrasah system were capable of running the administration in government positions. The British created their own system of governance and recruited people who graduated from the education system they introduced, which led to the collapse of the education system of the Muslim rule. As the key to one’s livelihood was at the hands of the British, one was compelled to accept their education system in order to survive. Muslims initially did not accept this system whereas the Hindus widely accepted it and began to advance as a community. They filled up all the important government positions; business and trade went under their control. They produced from their ranks all the professionals such as doctors, engineers, lawyers, etc. whereas Muslims had no place in government posts as a result of not accepting the British education system. After the failure of the Sepoy Mutiny in 1857, Muslims had no option but to adopt the British education system. As the Muslim soldiers were at the forefront of this mutiny, the British increased their oppression towards Muslims. At this critical juncture for the Muslims, the Islamic scholars, through their strength of faith and immense financial sacrifice, established a madrasah education system called Darse Nizami. This education system neither had any government support, nor was there any source of income for the scholars coming out through this system. Although it was a great injustice towards the scholars, Muslims covertly benefitted from their contribution. These scholars dedicated their lives to serve Islam and the number of madrasahs started to increase through their efforts. These madrasahs served to continue the legacy of Islam by such actions as creating Muslim scholars, helping Muslims with their faith issues, establishing mosques to ensure prayers were said in congregation, leading congregational prayers in mosques and introducing the five pillars of Islam through public events. The quality of the government education system at present is falling despite having a secured source of income and full support from the government. On the other hand, the Muslims will be ever grateful to the madrasah education system that has kept the Qur’an and Hadith alive amongst the Muslims – despite not getting any such support. If the scholars had not taken this initiative then there would be nothing left of Islam in this country. With the rapid increase of private madrasahs, the British thought of establishing their own madrasah system and a separate madrasah was established in Kolkata with an Englishman as its Principal. The purpose of starting this madrasah system was to create a group of Arabic-educated scholars who could teach Arabic and Persian in government schools and also work as registrars for marriage and divorce. These jobs were not available for privately educated madrasah students. Thus, there were two madrasah systems at that time – private education known as Qaumi Madrasah and government system known as Alia Madrasah. There was no provision for Bengali, English or any other modern subjects in the Qaumi Madrasah system, for which their graduates had no other jobs other than teaching in madrasahs or being imams of mosques. Even the Alia Madrasah system didn’t teach enough Bengali or English to enable students to then study at universities. Therefore, their job prospects were limited as well. In this situation. 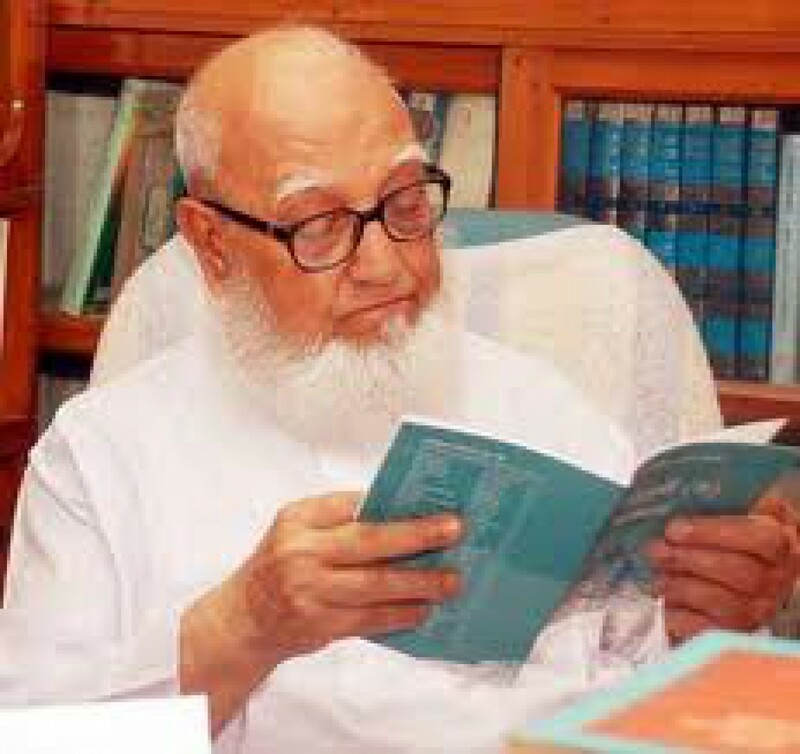 a renowned academic named Mawlana Abu Naser Wahid introduced a new system called ‘New Scheme of Education’ and obtained approval for it from the British rulers. In this new system Class 1 to 6 was called ‘junior madrasah’, Class 7 to 10 was known as ‘high madrasah’ and the intermediate level became ‘Islamic intermediate college’. The system became very popular and many junior high schools became junior madrasahs and high schools turned into high madrasahs. In some places, Islamic intermediate colleges covered Class 7 to intermediate levels under the same principal. Students completing high madrasah in this system were able to start college to get into general education and were able to take up any subject including sciences. Those who passed Islamic intermediate were able to do BA and MA degrees in Arts and Humanities at universities, but not science and commerce subjects. The reason this scheme obtained such popularity was that it was an alternative to the general and madrasah systems, and opened opportunities for those who wanted their children to receive a general education along with knowledge in Arabic and Islamic Studies. Through this, their children would get worldly success, but at the same time retain their Muslim identity by learning about Qur’an and Hadith and having a basic command over the Arabic language. Those who went to university from this system had the same privilege for employment as those from general education, but in their personal lives they were influenced by the Islamic way of life. Some of these students even went on to become vice chancellors of universities, like Dr Syed Muazzam Husain, (Dhaka University), Dr Syed Sajjad Husain (Rajshahi and Dhaka University) and Dr Muhammad Abdul Bari (Rajshahi and National University). Among some other prominent scholars coming from this system were Dr Kazi Deen Mohammad (former Head of Bengali, Dhaka University) and Dr Mohor Ali (former Reader of History, Dhaka University). Unfortunately, during the autocratic rule of Ayub Khan in the late 50s, some government officials with anti-Islamic and western views conspired to get rid of the new scheme. They gave different excuses and turned junior madrasahs into junior high schools. Within five to six years, the high madrasahs and Islamic intermediate colleges had also changed into high schools and general colleges respectively. I decided to discuss here the education systems of that time so that readers can understand the context in which my father and grandfather decided to admit me into a junior madrasah despite my success in primary school and the loss of one academic year. I was born in the famous ‘Mia Saheb’s Estate’ at the Municipal Road in Lakshmibazar, Dhaka, which is my maternal grandfather’s estate. The tradition of the first child’s birth taking place at the mother’s paternal house still exists today. One of the most famous ancestors of this sufi family was Shahid1 Mawlana Shah Sufi Abdur Rahim – popularly known as ‘Mia Saheb’. Born in 1074 AH2 (1663 CE) in Kashmir, he was the tenth descendent of Shah Abdul Qadir Jilani3 (also known as Bara Pir ‘the big sufi’). His father Shah Sufi Abdullah had come to Kashmir from Baghdad for business. Shah Abdur Rahim began teaching in Lahore after graduating in Hadith4 in 1114 AH. He had spent a few years in Makkah and Madina after living in the wilderness for 20 years, and relocated to Murshidabad in India to preach Islam during the reign of Emperor Aurangzeb. He came to Dhaka in 1120 AH at the age of 46, accompanied by his nephews Shah Nazimuddin and Shah Bahauddin. There was a large estate in Lakshmibazar at that time full of various kinds of trees. They included wild trees under which he began to live along with his companions, sustaining themselves by having fruits of the trees around them. Many people came to visit them after hearing the news of three foreigners in the area. His handsome appearance and his preaching of Islam impressed the people and the number of his followers increased rapidly. They also built a house for him under the tree and gave him the respectful title ‘Mia Saheb’. Hence the tree orchard came to be named ‘Mia Saheb’s Estate’. His fame as a true servant of Allah spread everywhere and people from far away, including Hindus, would come to see him and ask him to pray for their sufferings to be reduced or their illnesses to be cured. Shah Abdur Rahim never married and since his youth would often go into meditation. This intensified in his later life when he preferred to often be in solitary conditions. He was martyred in 1158 AH at the age of 84 when an anonymous man hit him seven times with a sword while he was in meditation. Then his nephew Shah Sufi Nazimuddin became the sufi leader of the area. He died in 1230 AH after living for over one hundred years. After that, his son Shah Sufi Badiuddin became the leader of the sufi tradition until his death in 1269 AH when his younger brother Shah Sufi Kamaruddin took over the sufi leadership. Shah Sufi Kamaruddin had no son and his two daughters were married to the two sons of Shah Sufi Ali Abdullah, also known as Emdad Ali of Syedabad in Kaliakor5. My maternal grandfather, Shah Sufi Abdul Munim, was the younger of the two brothers. Shah Sufi Ali Abdullah’s ancestor Hazrat Mawlana Shah Sufi Huseini arrived in this country in 1135 AH from Iran via Delhi and settled in the Bariab village of Kaliakor, which was later known as Syedabad. Shah Sufi Kamaruddin (My grandfather’s father in law) died in 1305 AH while in meditation and according to his wishes his favourite grandson (my eldest uncle) Shah Sufi Abu Yusuf Abdullah became the sufi leader at the age of only 13, though he took his oath as the sufi leader from his father before the latter passed away in 1326 AH. My uncle’s eldest son Syed Ahmadullah became the sufi leader after his father’s death. He completed his MA in Islamic Studies from Dhaka University and wrote a book in Urdu called Ainun Jaria (Flowing Cascade) from where I got the history of my mother’s family. He had gifted me the book himself. My maternal grandfather’s father in law Shah Sufi Kamaruddin was one of the founders of the famous Mohsinia Madrassah (now Kobi Nazrul Government College) in Dhaka where my paternal grandfather came to do his higher education. He was looking for tutored lodging6 as he was unable to bear the costs of hostel life. One of the teachers in the madrassah told him that the sufi leader of ‘Mia Saheb’s Estate’ was looking for someone to teach his son proper Qur’an recitation. My paternal grandfather was selected to teach my eldest uncle (who later became the sufi leader at age 13) by my maternal grandfather out of three candidates. When my father went to study at Mohsinia Madrassah, my grandfather took him to my eldest maternal uncle (my grandfather’s student) who kept my father as a tutored lodger to teach his eldest son Syed Ahmadullah. 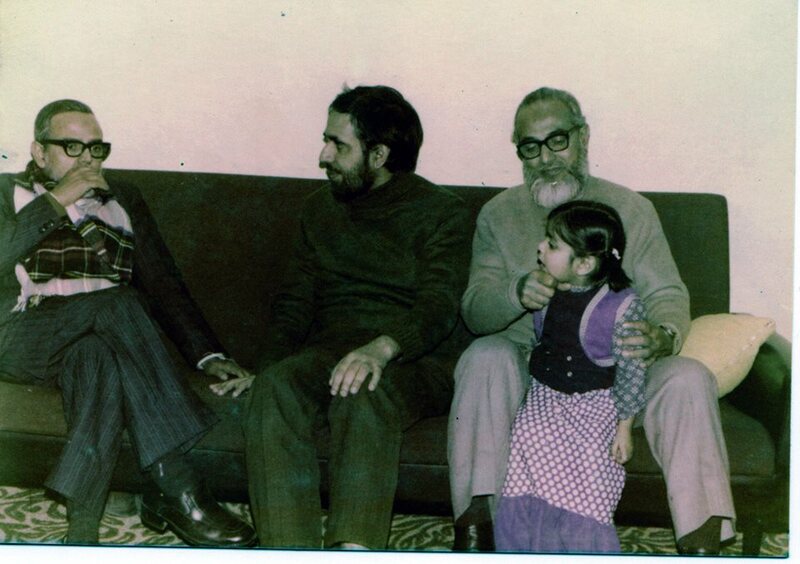 My father was very fond of his student, particularly because he used to pray tahajjud7 from a very young age. My paternal grandfather proposed to my eldest maternal uncle for my father’s marriage to his youngest sister. My mother was only 4/5 years old when her father passed away. So her eldest brother gave her the love of a father. My mother also lost her mother at a very young age and I witnessed the mother-daughter relationship my mother enjoyed with her sister in law (my eldest uncle’s wife). My uncle remained silent and seemed a bit embarrassed at the proposal of my grandfather, which made my grandfather disappointed and he complained about this to the famous sufi leader of Narinda (in Old Dhaka) Shah Ahsanullah with whom my grandfather had a very good relationship. My uncle respected Shah Ahsanullah for two reasons: firstly because he was of his father’s age, and secondly because one of his sisters was married to Shah Ahsanullah’s son. After my grandfather’s complaint, Shah Ahsanullah called my uncle and asked why he was reluctant to get his sister married to my father. My uncle said, “I have observed this boy closely and like him very much, but how will my sister live in a village? She may feel that I have tried to get rid of her as her father is not alive”. In answer to that, Shah Ahsaullah said, “You will not find a boy like him among thousands in terms of education, looks and family background. Do you think he will live in the village forever? You should agree to this proposal if you don’t have any other objections.” My uncle immediately accepted the proposal. My mother related her experience of village life to me. The first major challenge she encountered after arriving there as the daughter-in-law was with language. The language of Old Dhaka was a type of Urdu, which was the spoken language of all respectable families including the families in ‘Mia Saheb’s Estate’. No one in the village could understand my mother’s Urdu including my grandmother; on the other hand, whatever Bangla my mother knew was quite different from the dialect spoken in the village. So she found herself in an awkward situation failing to communicate with anyone. My mother became the centre of amusement for the maid servants and other ladies from neighbouring houses. They would burst into laughter when my mother would stare at them with blank face failing to understand their jokes. Even my grandmother felt helpless in seeing my mother’s situation. Rumour spread around the village that there was a foreign daughter-in-law in the Moulvi House8 who was so pretty that one could not take one’s eyes off her and who makes everyone happy with her sweet smiles. However, she remains silent when she is spoken to. She is not dumb, but what she says is incomprehensible. When my mother would become exhausted with rural life she would write to her brother who would realise that his dear sister wanted to come to Dhaka. Accordingly he would send my youngest uncle to bring my mother home. Only my grandfather was able to communicate with her in Urdu. Occasionally, my grandfather would go inside the house to inquire about my mother and her timidity would instantly disappear as she would speak freely to her father in law without any inhibition. My mother became familiar with village life within a year. After spending 15 years there, she finally gained the opportunity to enjoy life in a city again when my father was transferred to Chandina9 in 1936. I heard from my father that once there was a cholera epidemic in the village and my mother was caught with severe diarrhoea, which made my grandfather extremely concerned to the point that he shed tears for her. When my father tried to console him he said, “I know that I can get another daughter-in-law if she doesn’t make it, but where will I get a daughter-in-law like her? That is why I am pleading to Allah for her recovery.” My mother was able to endure all the difficulties of village life due to the sincere love and care of my grandparents. 4 Prophet Mumammad’s (PBUH) actions, sayings, and approvals are known as Hadith. 6 A now extinct tradition where poor meritorious students would be given accommodation and food in exchange for teaching the children in that household. Our beloved Prophet (PBUH) said, “If one’s deeds pull them behind, their family cannot bring them forward”. This proves that there is nothing to be proud of in one’s family background; the most important things here are faith and actions. There have been disbelievers in prophets’ families, and prophets have been born in families of disbelievers. However, family background can be significant if there is a combination of good family and good character. All people are the children of Adam (PBUH)1. Some people are revered by others due to possessing certain praiseworthy qualities and characteristics. The fame of these people spreads everywhere and their children enjoy the respect of society for being their descendants. This is how a family attains high status. Yet, if someone within that family is detested as a person, then they cannot escape simply by evoking the blood of that family. There is no harm if the children from a good family are respected when they are able to retain the family status by developing a high moral character and maintaining the positive traditions of their ancestors. In fact, it can only be positive if one is inspired by the admirable deeds of one’s ancestors; but without this, just being proud for being born in a noble family is harmful and meaningless. This is the context in which I intend to write about my family. There is no written history of my family, but I can trace back up to five generations having heard it from my father and grandfather. My father was Mawlana2 Ghulam Kabir; his father was Mawlana Abdus Subhan; who was the son of Sheikh Shahabuddin Munshi; whose father was Sheikh Bakhtiar, who was the son of Sheikh Taki. Sheikh Taki probably first began to live in the village of Birgaon beside the river Meghna, but there is no record of where he came from. The earlier generations used ‘Sheikh’ with their names, but as my grandfather didn’t use it, our family no longer uses this title. I heard from my grandfather that there were seven generations before him where there was only one surviving son in each generation. He had a younger brother who died before getting married. After completing his education, my grandfather was married into an illustrious Syed3 family, and after his wedding, before leaving for Hajj4, his father Sheikh Shahabuddin Munshi told him, “I will pray to Allah at His Holy House that He blesses you with four sons so that our family increases in number. I want to spend the rest of my life beside Allah’s House and do not intend to return”. He experienced a beautiful death as he passed away the following year during his second Hajj while at Arafah5. My grandfather has had the greatest influence over me and I enjoyed the opportunity of spending a lot of time with him until his death when I was 14. Although I never saw my great grandfather, I felt strongly for him from the stories I heard about him; he used to plead to Allah that his descendants followed the true path of Islam. My father was the eldest among my grandfather’s five sons and one daughter. I was my father’s first son and the eldest of the generation. My grandfather was the first noted scholar of the Nabinagar sub-district. 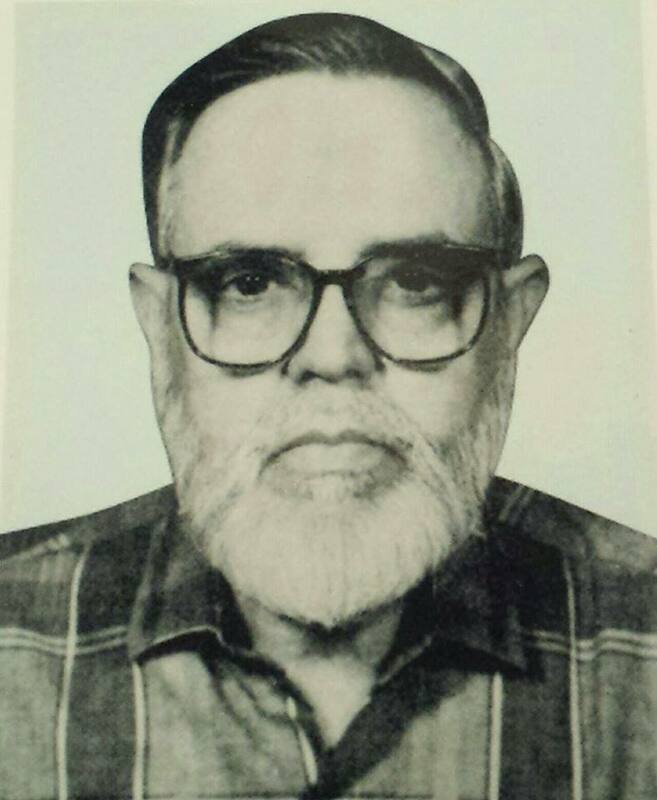 He was a teacher of the famous Mohsania Madrassah in Dhaka (Later, Islamic Intermediate College, now Kobi Nazrul Government College) after graduating from the same institution. When my great grandfather passed away, people in our village demanded that they should receive a similar service from my grandfather in spreading Islamic learning. Therefore, he accepted a job as the Marriage Registrar of Nabinagar and relocated to the area before retiring at 65 and spending the rest of his life in the village. People from far away used to come to visit my grandfather to learn about Islam, and he would teach them with utmost sincerity. He spent very few nights at home as he used to stay at a cottage he built beside a mango orchard at the northern border of our village, and would come home only during the day. When I came home during summer holidays, until I was in Class 6, I used to study by the mango orchard along with my younger brother and my youngest uncle where we would also enjoy the mangoes. There were seven or eight large mango trees in the garden and the thickest and strangest one was planted by my great grandfather while the rest were sowed by my grandfather. I developed my passion for gardening from my grandfather, with whom I once worked to cut some older trees and plant new ones. Later, I learned a lot about gardening from my father in Chandina6. As their eldest grandchild, I was very close to my grandparents. My father spent six days in Nabinagar, so I saw him very little. My younger brother, Ghulam Muazzam, and I would sleep with our grandmother whilst my grandfather would never have his meals without me. As far as I can recollect, my grandfather was my best friend who would often call me towards him and teach me many good things. This strong bond with him once led to a problem. On that occasion, my grandfather accompanied my mother, my siblings and I to Dhaka. When he was about to return to the village, he told me, “My dear, won’t you go with me? How can I stay at home without you?” I rushed to my mother and said, “Please give me my clothes. I want to go home with grandfather”. My mother was surprised and attempted to discourage me, but I was adamant and emotional, so I went back with my grandfather. However, immediately after returning home, I began to yearn for my mother and siblings and would cry for them, though I refrained from expressing this emotion in front of my grandparents. I still remember that I used to go to an isolated place and cry for them. My grandfather’s death was my first experience of witnessing someone in their death bed. It was Ramadan in December or January 1936. I was home as my madrassah7 was closed. When not studying, I spent most of my time with my grandfather, who had no major illness other than old age complications. He had been suffering from loose bowel motion and was getting weaker day by day. He realised that he wouldn’t live much longer, so he would ask whoever came to see him to pray for him saying, “Please pray so that the angel who comes to take my life does it with ease and causes me less discomfort”. The day he passed away, my grandmother, one of my uncles and I were sitting next to him. He did tayammum8 and completed his morning prayers while lying on his bed. When my grandmother stood to pray after he finished, he spoke loudly: “Please go to pray after bidding me farewell as the angel is coming now”. We looked at him with astonishment. My grandmother approached him and said, “How can you leave now? Your only daughter will be devastated if she can’t see you!” My grandfather then said, “It is painful for me to wait”. My aunt came at 10am on a palanquin9 and we were astounded to see how better he looked after seeing his beloved daughter. The father and daughter spent a long time chatting and later that day he looked much healthier, whereas he had been ready to leave this world that very morning. Following the evening prayer, my aunt brought him a cup of milk. He drank the milk from his daughter sitting on his bed and requested us to lay him down after that. He had my grandmother and my aunt on one side and my uncle and me on the other. We began talking cheerfully when seeing him in a better condition. After a few minutes, he asked us to slide him towards right. Thereafter, he put his right hand under his right cheek and said, “Don’t talk now and let me sleep”. We observed that his lips were moving slowly and his fingers were counting, and gradually the counting stopped. We thought he had fallen asleep. After 15-20 minutes, my grandmother checked, couldn’t find a pulse and found that he had stopped breathing. Everyone realised that he had passed away. I had never heard about such a death, which further increased my love towards my grandfather. I have strong conviction that he was very dear to Allah. His memories have continued to influence me since then. I have tried my best to follow his advice at all times and feel contented that I have been able to do so. I can’t describe how much his advice has helped me in my life, which makes me pray for him even more. Before his death, my grandfather called my eldest uncle and dictated his will in which he decided to give me a portion of his land. My uncle looked after that land while he was alive and later I got earnings from that land. This is how I continued to receive my grandfather’s love long after his death, and I remember to pray for my grandfather whenever I pray for my parents. I remember fondly the qualities of my father, grandfather and great grandfather who have influenced me greatly and make me realise the importance of my family background. That is why I try my best to inspire my juniors in my grandfather’s dynasty towards practising Islam. 6 A city in the district of Comilla where the author’s father was employed. 8 Ablution before prayer using clean dust as substitute for water. This is used in the absence of water or in times of illness. 9 A covered seat or sedan chair carried on poles by two or more men. I was born in Dhaka on 7 November 1922, although I spent my childhood mostly in the village. My place of birth was a distinguished Sufi household known as Mia Shaheber Moydan (‘The Mia Shaheb Estate’) in Lakshmibazar, Dhaka, which happened to be my grandfather’s house. I was the first child of my parents, and according to the tradition of that time the first child was to be born at the maternal grandfather’s house. Hence, I was born in the city despite our family living in a village at that time. My mother made annual visits to the city (these were usually for a month or so) and so, from childhood, I became familiar with both city and rural life. I studied in village schools until Class 6. I first went to the village primary school where I remained up until Class 3. Then, in order to learn Arabic, I started from Class 3 again until Class 6 at Barail Junior Madrassah, which was in a village five kilometres away from where we lived. Thus, I was brought up in a predominantly rural environment until I was 14. It is difficult to remember the early years of one’s life; however, I can still recollect some differences between my city and village lives of that time. While in the village, I was able to wander around my own, including in the nearby villages. During the dry season, the huge farmlands between the villages would become our playground. As our village was the centre of the local authority and not every village had a school, children from nearby villages used to study in our school. That is why I had classmates from various villages from Class 1 onwards whose homes I sometimes visited. In contrast, whenever I came to the city, I was confined to only the houses of my uncles and was not permitted to leave the family residence as for reasons of safety my elders were afraid to let me go to the main road adjacent to my grandfather’s estate. I had very few cousins of my age to play with, and as I was not allowed to leave to play with children in the neighbourhood, I would often miss my village home and would be eager to return there after a few days in the city. I developed a strong bond with everyone in the village. Those who were of my grandfather’s age became my great uncles; those in my father’s circle became my uncles; and elders and youngsters in my generation became my elder and younger brothers respectively. I had similar relationships with the women of the older generations as well. Therefore, there were many people who could show their affection and love towards me. This was completely missing in Dhaka as I could not visit anywhere other than my uncles’ houses. Most neighbours of my grandfather’s estate in Dhaka were Hindus with whom we lacked social links. I never enjoyed having a shower in Dhaka as we had to throw a bucket into the family well to obtain water and had to have the shower next to the well, thus missing the pleasure of swimming in the river by my village. Although my mother wished to stay on in the city for a longer period, I used to long for the country after a couple of weeks in the city and I always preferred rural over urban life. I felt that I had many people who were close to me in the village who would call me towards them affectionately, embrace me and give me delicious food to eat, whereas I found no one with whom I felt as comfortable in the city except in the three houses of my uncles. There were fruit trees at hand in every house in the village. One mostly saw trees in the countryside and few houses, as if the whole area were an orchard. On the other hand, in Dhaka, I could see only buildings around me and very few trees. Therefore, I always loved the village more than the city. Although I was more fond of country life, when the time of the year would arrive for me and my mother to visit Dhaka, I would nonetheless become quite excited. We had to take the boat very early in the morning to the railway station at Bhairab. I used become quite restless the night before and would wake up often to check whether it was morning. I used to sleep with my grandmother, who would bring me back to bed whenever I woke up and say, “I’ll wake you up in the morning, so go to sleep now”. I don’t think I ever realised at that time why I was so keen to visit the city when I would become bored there within only a couple of weeks. Now I understand that humans always like change, so wanting to move on after being in one place for a while is a natural human instinct. The journey towards Dhaka would require transit by boat first, followed by rail. I was accustomed to boat journeys as it was the most common transport method during the rainy season in the village; so there was never anything new for me in that first stretch of the journey to Bhairab. The part I really relished was travelling by train from Bhairab to Dhaka. The sound of the train was very rhythmic to my ears and the slow, calming movement of my body inside the train was very comforting. I can still remember the rhythmic sound of the train. At the level crossing during my journey from home to the Jamaat-e-Islami office in Moghbazar, Dhaka, whenever a train passed by, I would reminisce about the memories of my childhood train journeys. While most people talk on trains, I remember that I would hardly speak a word to anyone during those childhood journeys. I savoured it to such an extent that I would never sleep on the train and would constantly gaze out the window, searching for words to describe the beauty of the scenery beyond. The Dhaka rail station at that time was at Fulbaria, which now is a bus station. We would proceed to my grandfather’s house by a horse carriage from the rail station. Horse carriages are no longer in use in Dhaka, but I used to love the ride, where four people would sit in the carriage, two on each side facing each other. As the journey was at a steady pace, I could enjoy the scenery around me. The sound of four pairs of trotting hooves was so soothing that I liked it even more than the sound of the trains. There were no rickshaws, auto-rickshaws or cars at that time. Horse carriages were the main transport vehicle of Dhaka and you could see them in abundance across the city. Our village is called Birgaon – as is the local authority. Travelling to our village involves taking a bus or a train to Bhairab from where you can continue by motorboat on the River Meghna to reach Birgaon. The illustrious railway bridge between Bhairab and Ashuganj was built over the Meghna River during the Second World War, when we used to travel to Bhairab to watch the construction of the bridge. Our village is four miles away from Bhairab’s river port. Throughout the dry season one had to walk a mile from the river pier in Birgaon to arrive at our house, but during the monsoon season the boat would stop just next to our house. Once I was having a particularly troublesome journey to Birgaon from Dhaka and asked my uncle, who was then headmaster of the village school, why his father had bought his house in such an inconvenient location. He smiled and said, “Our family have been living here even before my grandfather. At that time most trips would be done on water, so people built their homes near the river”. As a student of social science I later realised the historical truth of this fact. During those days most people would go to work in the field following the morning prayer and reading the Qur’an. I could hear the sound of Qur’an recitation from every single house whilst going to the mosque in the morning to read the Qur’an. This custom is almost lost now. The person who gave the call to prayer was our next door neighbour, Mr Aziz Ullah Munshi. There was no loudspeaker at that time, but Mr Munshi was a loud speaker himself and it was believed that people could hear his call to prayer from over a mile away. There is a tradition in the villages of Bangladesh of bringing gifts such as vegetables or fruits from one’s own garden, or eggs laid by one’s own hens, or milk of one’s cows, and so on, to a Sufi leader or to the mazar (burial ground) of a spiritual leader or to a spiritual leader himself. As my grandfather was a celebrated Islamic scholar, people began to bring gifts for him. My grandfather then declared in one of his Friday sermons that such gifts should be brought only for the mosque. He introduced a wonderful practice where people would bring their gifts to the mosque on Fridays, and after the prayers an auction would take place at the mosque to sell these items (with the proceeds going towards the mosque fund). There was no practice in our village of greeting everyone with salam1, although people would generally say salam to an Islamic scholar. A political leader would be greeted with adab, a type of greeting introduced by Hindus. People would talk to each other when they met, but the custom of salam was reasonably limited at that time. When I was a student of Barail Junior Madrassah our teachers encouraged us to greet each other with salam. I tried to practise this in my village and once greeted a political leader called Daru Miah with assalamu alaikum (peace be on you). He replied to my greeting with his hand, but I didn’t hear him say wa alaikumus salam (peace be on you too). Daru Miah was a prominent leader of the Indian National Congress in our local authority who was very well acquainted with my father. After my salam incident he was heard saying that I had become quite ill-mannered as I had failed to greet him with adab. Whether Hindu or Muslim, all gentlemen wore a dhutti (loincloth) at that time except those who were Islamic leaders. I remember that I once received a loincloth as a gift. Muslims stopped wearing loincloths after the Pakistani movement had become prominent. During weddings aristocratic individuals would wear a sherwani2 and a round tall hat called a rumi. The name of my sub-district is Nabinagar3-a name that fills my heart! What better name could a place have? I am unaware of the history behind this name, but it certainly carries a Muslim identity. However, the name of my district is quite the opposite. Though my sub-district is Nabinagar, but it is under the dominance of Brahmins4. That is, my district is called Brahmanbaria or in short Bbaria. I do not know the history behind this name either. I read an article on the subject in a monthly magazine called Brahmanbaria Sangbad (Brahmanbaria News), but whatever the writer wrote based on legends and hearsay certainly cannot be considered as history. However, there is no doubt that the Brahmin community must have dominated this place before, hence the name. I grew up observing the prominence of the Hindu community; many became successful in sectors such as education, employment, business, land ownership and beyond by assisting the British imperialists. Next to our local authority of Birgaon is Krishnanagar, where there was the house of a Hindu landlord surrounded by huge walls. When I was small I heard that Muslims were forbidden to pass by that house wearing their shoes or with their umbrellas open. Without the Pakistani movement for Muslim nationalism and without the partition of India in 1947, Muslims in this land would still be restrained by Hindu dominance. On 11 January 2012, Prof Ghulam Azam was arrested by the Bangladesh International Crimes Tribunal under false charges of crimes committed during the 1971 War of Independence. Following his arrest, one of his grandchildren wrote an article for openDemocracy on their grandfather. The English article was published on 7 February 2012. Presented below is a translation of the article into Bangla. Our gratitude to the translator for their efforts.